Only one tire glue is certified for use with the 100+mph XO-1: Traxxas Ultra Premium Tire Glue. The XO-1 relies on a high-strength tire bond to withstand incredible centrifugal forces at speeds in excess of 100mph. No other glue endures such high loads, which makes Traxxas Ultra Premium Tire Glue the ultimate adhesive for any tire and rim combination (and any other application that requires a high-strength bond). To preserve the maximum bonding power of Traxxas Ultra Premium Tire Glue, its bottle is specially designed to maintain a tight seal and prevent clogging. The bottle and nozzle are made of glue-resistant material, and a pin integrated into the tightly-fitting screw-on cap assures glue won't clog the bottle tip. 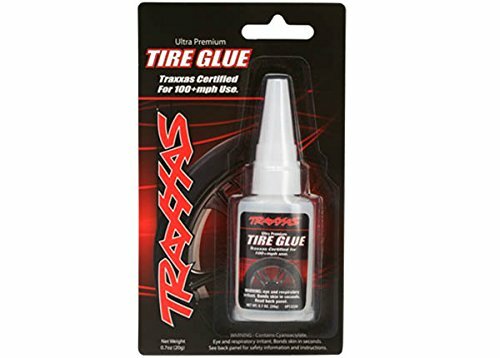 The tip's fine opening allows precise glue application every time you reach for Traxxas Ultra Premium Tire Glue. Traxxas Ultra Premium Tire Glue is custom-blended exclusively for Traxxas. There simply is no better bond for high-speed, high-power vehicles.